We all know what we like when it comes to food, don’t we? I certainly know which flavors I enjoy on their own and in combination with others, and I DEFINITELY know what flavors I don’t enjoy (*cough* mushrooms *cough*). But I have to admit that sometimes I can get a little myopic. I want peanut butter with my chocolate or tomatoes with my basil because that’s what I’ve always done—that’s what most people (and recipes) do. But what if I could get out of my own head (or mouth?) and open the door to a whole new world of flavor combinations I might never dream of? And what if they were actually really good? Well….there’s a book for that. 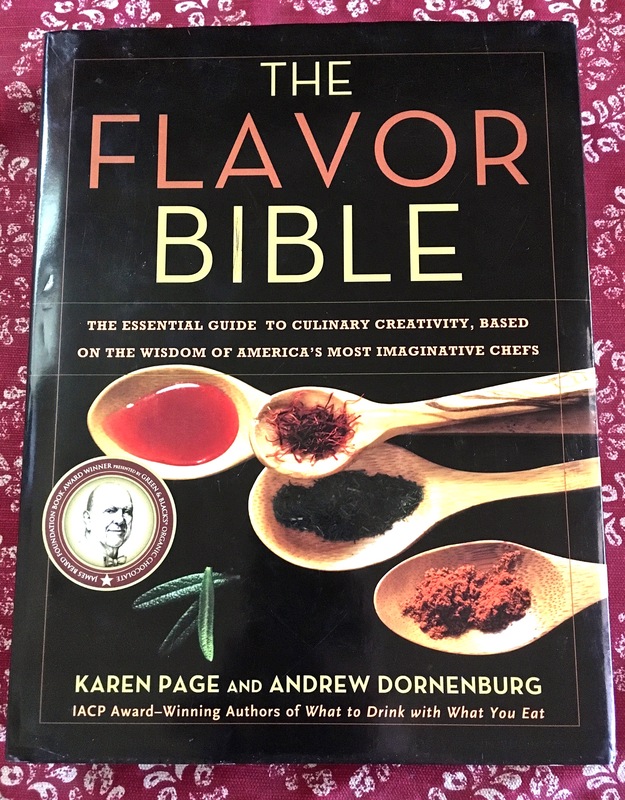 I like to call it “the cookbook that’s not a cookbook.” I stumbled upon The Flavor Bible by Karen Page and Andrew Dornstein by reading another food blogger rave about it as essential to her recipe development. All I knew was that it was some kind of compendium of flavor pairings, but the idea intrigued me enough to order it. And when the book arrived, it turned out to be even more interesting—and way more thorough—than I expected. This “cookbook that’s not a cookbook” contains no recipes, and is essentially a flavor reference book. Over the course of eight years, the authors surveyed dozens of head chefs at top restaurants throughout the country, asking them for their recommendations of flavor combinations. They then analyzed these recommendations and organized them into a sort of food thesaurus. The book allows you to look up any food, ingredient, or cuisine in alphabetical order to see what flavors complement it. Listed in bolded all-caps with an asterisk are the top 1-2% of recommended flavor pairings; bolded capitals are flavor pairings the chefs considered highly recommended; bolded are frequently recommended; and non-bolded listings are flavors that at least one chef recommended. Included with many of the food items and cuisines are identifiers like Season, Botanical Relatives (like, who knew almonds and peaches are botanically related? ), Tips & Techniques, Flavors to Avoid, and even fancy-schmancy descriptors of Function (i.e. warming or cooling), Weight (the ingredient’s relative density), and Volume (the ingredient’s flavor “loudness”). 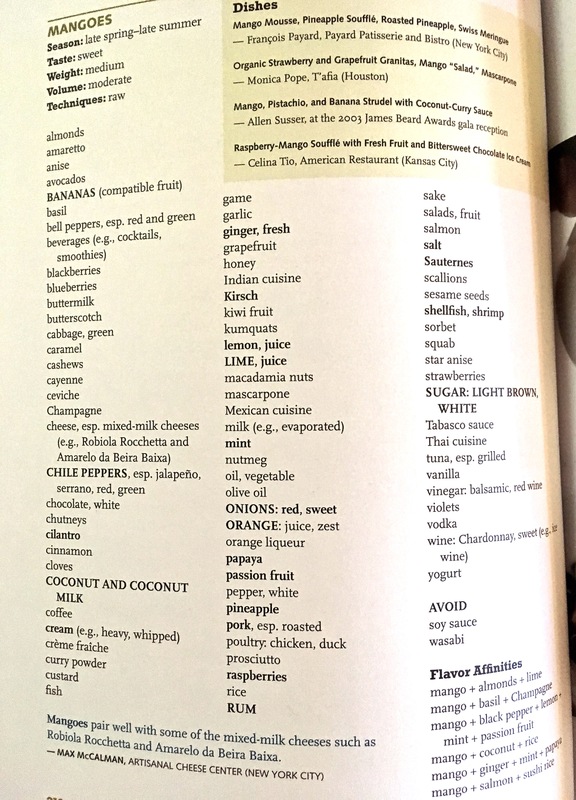 While the flavor reference guide takes up most of the book, there are also two sections at the beginning that offer some philosophy on the nature of flavor itself–the first explaining that it is a sum-is-more-than-its-parts combination of taste, mouthfeel, aroma, and what the authors call “the X factor.” Which is NOT a reality TV show, but rather our emotional reaction to foods. The second section covers how to choose the best ideal food/ingredient/meal/cuisine for whatever moment in time you find yourself in. I’ll admit, it’s a little high-minded even for a foodie like me, with headings like “Understanding the Essence of the Moment.” So I mainly stick to the reference section. The thing I love about this book is the same thing I love about a regular thesaurus. I think we all desire creativity and variety, whether in our language, our cooking, or any other area of life, but sometimes we get stuck and need something to boost us out of our own small thinking. The Flavor Bible is my go-to when it’s Sunday night before my week’s grocery shopping and the main ingredient I have left to throw together some kind of dinner is eggs…well, what goes with eggs? About 35 flavors, apparently, most of which I never would have thought of, and a couple of which I actually have on hand. Or if I want to make blueberry muffins for the millionth time, but want to mix it up a little (since this is, after all, the millionth time)–I haul out The Flavor Bible and realize that allspice or cloves could jazz up my recipe. Then I might get thinking about which other spices–or even herbs–could complement blueberries and end up going off the grid to make blueberry-thyme muffins. I can definitely say that this book has expanded my horizons and led to increased creative expression when it comes to my cooking. I’d recommend it for anyone who wants to add some interest to their cooking–or anyone who sees potential for adventure even in their food. What a cool resource! I’d love just browsing through and letting myself be inspired.